In the past, historians described at length in their books wars, battles, plots, even love affairs, but paid little attention to other factors which had a major impact on the rise and fall of the empires of the past. Today one of the key reasons behind the failure of Rome to withstand the barbarian onslaughts, is thought to have been the sharp fall in manpower caused by imported pestilences. Among these the bubonic plague stood for its devastating effects. The 1348 Black Death is thought to have reduced the population of Europe by one-third. In addition it caused a general economic recession. Vienna, located along trading routes linking Central Europe with Constantinople and Asia, was particularly exposed to pestilences. In 1629 a bubonic plague hit Vienna; fifty years later the pestilence spread again and returned once more in 1714. All knew what had happened in Rome in 596: St Gregory the Great while praying for the cessation of a plague at the head of a procession, saw an angel in the act of sheathing his sword, a sign that the calamity was coming to an end (the image used as a background for this page shows the angel at the top of Castel Sant'Angelo in Rome). For this reason during the pestilences in Vienna many processions took place during which the participants prayed to the Virgin Mary and to a selected number of saints to intercede with God for them. In 1667 the Emperor Leopold I erected a monument to the Virgin Mary to thank her for intervention to quell the pestilence and other scourges which had hit Vienna. The design of the monument was no doubt influenced by the column erected in 1605 by Pope Paul V opposite S. Maria Maggiore in Rome. 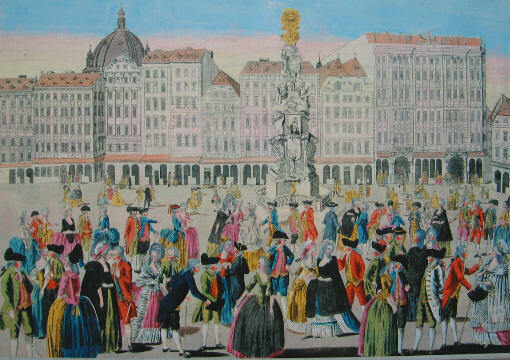 After the 1679 plague a monument specifically meant to thank God for the end of the scourge (Pestsaule) was erected in the Graben, a large square on the site of the ditch which protected the ancient Roman town. Pestsaule set the pattern for many similar monuments in other Austrian towns. It is a spectacular spiral of clouds, angels and saints. It shows the hand of Ludovico Burnacini, an Italian scenery designer who played a key role in the cultural life of Vienna in the late XVIIth century. A smaller, but very similar Pestsaule can be seen near the Church of St. Ulrichs which is located without (outside) the walls. The Pestsaule in front of Piaristenkirche, another church without the walls, shows a design which is midway between a column to the Virgin Mary and the Graben Pestsaule. These monuments were usually accompanied by statues of saints to whom the inhabitants of Vienna attributed a particularly effective power of intercession. In addition to Pestsaule and similar monuments, Vienna shows references to the Roman tradition of portraying an angel sheathing his sword as a sign of a pestilence coming to an end.